Ok So its getting near to my Partners Birthday & his Brothers ( there twins if you didn't know ) - Well i didn't want to just do a basic everyday " Congrats it's your birthday" Card . I wanted it a bit personalised but not over personalised, Yep you guessed it im a bit fussy, So i Decided that i would chose a theme that i know His brother is into , Which happens to be Oriental. Right panic Stations for me .. An Oriental card!!! 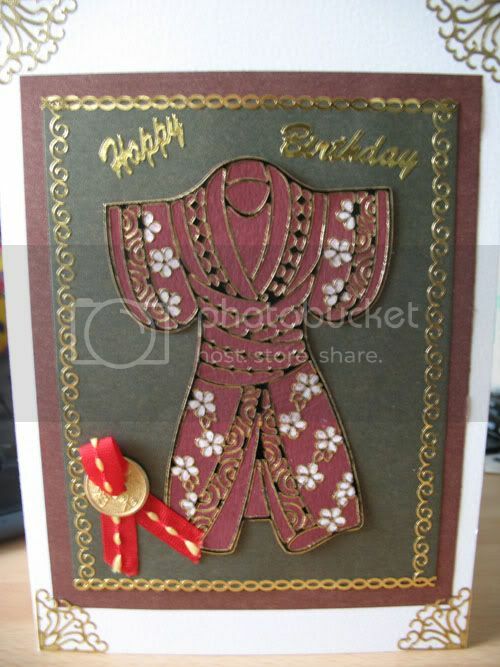 - I have firstly never done a Oriental Card , Secondly never even owned anything Oriental to make something, So i went on ebay had a look about and found some lovely Peel Off's and thought well there cheap, I'll give it ago rather than spending the money out on a nice expensive Oriental stamp that i may never use again. This is the outcome of my First ever Oriental Card for his Birthday ( i do hope he never finds this blog and reads it Especially before the 23rd Aug - There Birthdays! This entry was posted on 19.8.07 and is filed under No Stamping Cards . You can follow any responses to this entry through the RSS 2.0 feed. You can leave a response, or trackback from your own site.